In 2008, the first year of Best Cleaners’ Coats For Connecticut campaign, 2,000 donated coats were collected, cleaned and delivered to local shelters and Salvation Army centers. Considered a success, it was decided to make it an annual appeal and expand the reach by partnering with other businesses and organizations. Since then, and thanks to Best customers and a partnership with the Salvation Army, WFSB-News 3, and Young’s Printing-Fast Signs, an avalanche of warmth went out to those struggling to get through the cold winter months. A total of 92,000 coats have been distributed to date. Last year alone, over 18,000 coats were collected, cleaned and delivered to Salvation Army centers in Bridgeport, Bristol, Hartford, Meriden, Middletown, New Britian, New Haven, New London and Waterbury. This year, the goal is to meet or exceed 18,000 coats. Thanks to our new campaign partner, Two Men and A Truck, who donated the use of two storage containers for staging cleaned coats prior to delivery, things are in place for another banner year. We encourage our customers, our friends, and the general public to clean out your closets and donate gently-used winter coats and jackets. We also ask local businesses and organizations to consider running a coat collection of their own. All sizes for all ages are needed, but the demand for children’s coats is always high. Simply bring your coat donations to any of the 12 Best Cleaners’ location before December 22nd and help keep Connecticut warm. 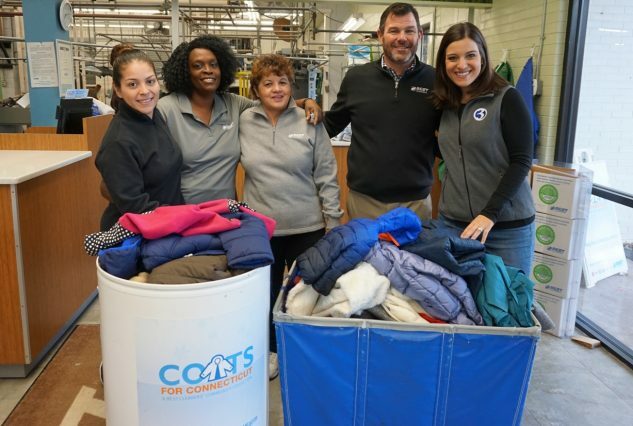 Pictured Above: WFSB-NEWS 3 Reporter Eva Zymaris helped kick off the 10th Annual Coats For Connecticut campaign with Best Cleaners owner Shawn McCann and the Best Main Glastonbury team.